Minsk: Dinamo stadium reconstruction to end in 2019? Complete reconstruction of Stadion Dinama began from dismantling its immense upper deck in 2013. After that phase work was not resumed to this day. Why? Back then works were carried out to make the stadium a football-only building. This scheme was later dropped in favor of delivering separate national stadia for football and athletics. This one is to retain its running track, while a new football arena will be built elsewhere. 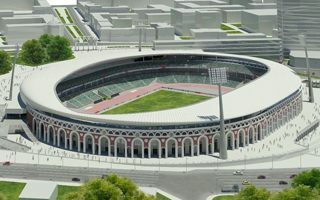 In 2013 it was envisaged that the current Stadion Dinama will be rebuilt to an athletic stadium by 2016, but that deadline is unreachable at this point. Still, authorities assure the building will be ready for its first secured post-work event, the 2019 youth festival (EYOF). “The president made himself quite clear. Belarus doesn’t only want to rebuild this stadium, we already have international obligations to do it. […] It’s a matter of honor for us to deliver it in time”, said Maxim Rizhenkov, physical fitness assistant of president Lukashenko.